Happy Monday, y’all! I hope that your year is off to a great start! Did you make any New Year resolutions? I love the holiday season, but there’s just something about starting a fresh new year that is also very exciting to me. This recipe is a result of me getting a little carried away in the produce department of Trader Joe’s around Thanksgiving. When the produce is looking really good at the store, I have a tendency to do that. Anyway, I had a large bag of celery that I needed to use up, so I decided to make some type of creamy celery soup with it. The addition of potatoes gives the soup a bit of creaminess without heavy cream or half and half. 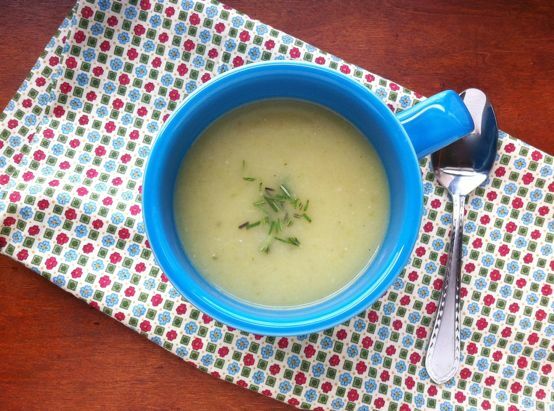 Fresh Rosemary adds delicious flavor and aroma to the soup. 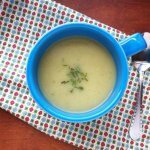 This Creamy Celery Potato Soup makes a great starter soup, which serves four. Do you ever get carried away when shopping for produce? Heat oil in a (4-quart) pot over medium heat. Add celery, onion, and potato, season with salt. Cook, stirring occasionally, until vegetables begin to soften, about 8 minutes. Add the mince garlic and fresh rosemary and cook for 30 more seconds. Pour in the chicken stock, bring to a boil, reduce heat and let simmer until vegetables are tender about 20 minutes. Add the grated cheese and stir. Use either an immersion blender, food processor or blender to puree until smooth. If using a food processor or blender, you will need to work in batches. Add salt and pepper to taste. Serve with extra grated cheese for garnish.